Why Do We Do What We Do at a Ghost Walk? Yesterday a very nice lady stopped by my desk and asked “Can you explain why you do what you do at the Ghost Walks?” This started a long conversation. First I asked what exactly she needed to know. Her answer was “all of it”. I told her this would take a little time and she said that would be fine. It made me think that there may be others of you that would like to why we do what we do. Why do you limit the number of people at each Walk? The reason is simply, if you have too many there seems to be too much conversation and recordings or evidence tends to be tainted. We want everyone to have the best experience possible. Why do we charge for Ghost Walks now, when we did not before? Currently the Sweetwater County Library System Foundation has an opportunity to receive matching funds for every dollar received. By charging a small fee of $5 each person, this money will become $10. Each library in the System may then make application to the SWC Library Foundation for funds to pay for item that the regular budget does not. Why do we use the “Ghost Hunting Gadgets”? The “gadgets” that we currently use are as follows: KII Meter, EMF Detector, Laser Grid Pen, Ghost Box, digital recorder, camera, digital thermometer and digital camcorder. KII/EMF: The reason for using the KII and EMF meters are when they come in contact with anything paranormal they will either light up or show a reading. Laser Grid Pen: By shining the pen in one area it places an array of green or blue light (depending on which pen it used). If a spirit should move between the light and the wall/ceiling etc. it is directed at, it will block out some of the dots in the grid and will show the user where they are. Ghost Box: By using AM or FM radio settings, questions may be asked and the spirits may choose to use words within the radio stations broadcasts to answer. Digital Recorder: By using a digital recorder a person may ask questions and receive possible answers. Many times when asking questions a person will not hear anything, but after reviewing evidence from this device, there may be voices, noises, etc. to coincide with the questions asked. These are known as an EVP (electronic voice phenomenon). Digital Thermometer: The digital thermometer works by pointing the laser at anything and it gives a reading of the current temperature. If a spirit comes into contact with the area you are pointing the thermometer the temperature should change either colder or at times warmer. Digital Camcorder: Like the camera, a digital camcorder is useful in capturing images along with sounds of anything that might be happening. Personally I have also found a camcorder useful in demonstrating after an event what you do and the reactions to what we do have happen during the Walks. Thermal Pad: The library purchased a new thermal pad. The idea behind it is if a spirit were to touch it the pad would show blue if cold or light to white if warm. A Childs Ball: By placing a child’s ball on the floor or on a table you can invite a child spirit to “come and play ball”. We did seem to have good luck attracting spirits to the ball and will use this tool again. I hope that the information I have shared will help explain our procedures. The holidays are a time for people to get together and enjoy the flavors of the seasons. 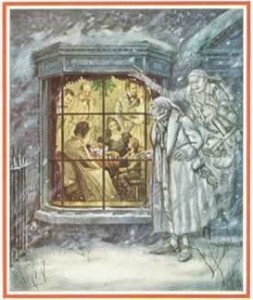 New this year the Sweetwater County Library is presenting “Ghosts of Christmas Past” on December 1st. This is your opportunity to join us in an evening of warm drinks and fine desserts followed by a special Charles Dickens inspired Ghost Walk. The desserts are provided by the Sweetwater County Library staff, which will not only share with you their decadent treats, but will include recipe cards as well. Tickets will go on sale Monday October 29th at 9am and will be available at the Sweetwater County Library only. There will be two tours 6pm to 8pm and 9pm to 11pm. Patrons must be at least 15 years old. Admission to the Ghost Walk is $15 each with proceeds benefiting the Sweetwater County Library Foundation. No refunds will be given and tickets are sold on a first come first serve basis. The public will also have a chance to win tickets to the Ghost Walk through the library’s Facebook page at facebook.com/sweetlibraries. Please check the library’s Facebook page for more details. This unique idea was the brainchild of Scott Kinney the Sweetwater County Library System Director. Once the idea was shared with the staff we knew it would be our next special event. With a bit of fun and whimsy, the Ghost Walk tour guides will be dressed in “Dickens’s-like costumes” and will lead you on what we hope will be a very interesting encounter with our own spirits. Why are we having another Ghost Walk so soon? It is simply because of public requests. We are trying to provide extra paranormal investigations whenever possible. Much of this depends on the available time that the SWCL staff have. We do our best, but please remember our time is somewhat limited with all the other duties and programming that are scheduled. What might I encounter while on a Ghost Walk? : It is not unusual to have what the experts call a “personal experience” while on one of our tours. This is something that is not documented or caught on camera and may include seeing shadows, feeling a touch, hearing a noise, etc. The Library receives many reports of this both on tours and by random patrons while in the library. Most Ghost Walks seem to have several spirits wanting to communicate with us. One example is using the KII we can ask a question and the spirit can use the device to answer by lighting up the lights for “yes”. Questions we often ask are “Are you a man?”, “Are you a woman?”, or “Are you a child?” With the “ghost box” we can ask a wide variety of questions. The results are many times jaw-dropping. “What is an EVP”? It is simply where you catch sounds or voices on any recording device that is otherwise not heard by the human ear. You will only hear it when playing back the recordings. What is a Ghost Box? The Ghost Box is also known as a “Frank’s Box”. The Box was first created by Frank Sumption and those in the paranormal investigating world many times still call it as such. The Ghost Box basically scans throughout AM/FM radio waves and allows the spirits the chance to stop the scanner on a word or phrase to communicate. It has become very popular during the tours because of the amazing answers we have received. What can I bring to the tour? We encourage anyone attending to bring their own equipment if it can be carried easily such as digital camera, digital recorder, KII, EMF detector, etc. It is not necessary to bring a ghost box as the Sweetwater County Library has their own and only one can be used at a time. Cell phones are allowed and actually do work well for recording EVPs. One word of caution when using your cell phone, do not get too close to anyone that is holding a KII or EMF detector. They can and do cause interference. Why are some tours quieter than others? In all the time that our crew has hosted the Ghost Walks we have only had one tour that was “quiet”. “Quiet” to us is a group that does not open up to the spirits and therefore the spirits do not respond. Last year Ellie Davis and I had the great pleasure of meeting psychic Chic Coffee while at the Stanley Hotel in Estes Park, Colorado. He explained the way spirits interact is as such, “If you go into a room and there are friendly people in one corner and unfriendly people in another which would you approach?” This seems to be the way it works at the library. If you attend a ghost walk please come with good energy and an open mind. We hope you will join us for our unique holiday event “Ghosts of Christmas Past” on December 1st. Please stop by the library to purchase your tickets. For more information please call 307-875-3615 or visit us on Facebook at http://www.facebook.com/#!/sweetlibraries.